It is not until the time of the Reformation that we find any serious discussion of the Sacrament of the Lord's Supper as being an emblem or being only symbolic of the Body and Blood of Christ. It was on this point of departure from tradition that reformers Martin Luther and Ulrich Zwingli could not agree, Luther believing as Christians had through the ages that Christ was truly present in this sacrament but Zwingli and Calvin held that the Eucharist was only a symbol in which Christ was not truly present. Current LDS beliefs and hymns seem to be closely tied to Zwingli's non-traditional teachings but are strangely inconsistent with the Book of Mormon. The Gospel according to St. John is fairly explicit in chapters 4 and especially 6 about the necessity of actually participating in receiving the Body and Blood of Christ. At the Lord's Last Supper, Christ uses the words, "THIS IS MY BODY" and "THIS IS MY BLOOD" (Matt 26:26-28, Mark 14:22-24, Luke 22:19-20). "The cup of blessing which we bless, is it not the communion of the blood of Christ? 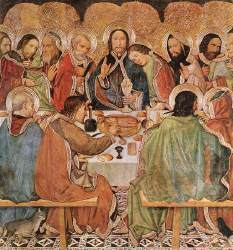 The bread which we break, is it not the communion of the body of Christ? For we being many are one bread, and one body: for we are all partakers of that one bread... For I have received of the Lord that which also I delivered unto you, That the Lord Jesus the same night in which he was betrayed took bread: And when he had given thanks, he brake it, and said, Take eat: this is my body, which is broken for you: this do in remembrance of me. After the same manner also he took the cup, when he had supped, saying, This cup is the new testament in my blood: this do ye, as oft as ye drink it, in remembrance of me. For as often as ye eat this bread, and drink this cup, ye do shew the Lord's death till he come. Wherefore whosoever shall eat this bread, and drink this cup of the Lord, unworthily, shall be guilty of the body and blood of the Lord. But let a man examine himself, and so let him eat of that bread, and drink of that cup. For he that eateth and drinketh unworthily, eateth and drinketh damnation to himself, not discerning the Lord's body". (I Corinthians 10:16-17, 11:23-29). I believe as did Paul that the cup of blessing that we bless and the bread that we break is the sharing of the blood and body of Christ, as it is for all who discern the Lord's body. Why did early LDS leaders take sides with radical Protestant Reformers instead of holding to the beliefs of the Primitive Church, following what Jesus himself is quoted as saying in the Book of Mormon? Were early LDS leaders turned away as many of Jesus' followers who said that eating the flesh of Christ as meat and his blood as drink was a "hard saying; who can hear it?" This teaching had offended them and it still does today. From that time many of his disciples went back, and walked no more with him. (John 6) Can you hear it?